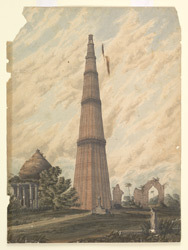 Water-colour painting of the Qutb Minar at Delhi. c.1830. The artist and the circumstances of acquisition are unrecorded. The Qutb Minar was built by Qutb-u'd-din Aibek from 1199 as part of the Quwwat al-Islam or 'Might of Islam' congregational mosque complex at Delhi. It was designed as a dominant visual sign of the arrival of Muslim rule in northern India and as a marker of the presence of a Muslim place of prayer. The minaret has sloping sides which are alternately fluted and flanged. Its surfaces are covered in both foliate and calligraphic relief-carved decoration. It was subsequently added to by his successor, Iltutmish, before the top was restored by Firoz Shah in 1369, who used marble to face the upper section. In 1803 the Qutb Minar sustained damage during an earthquake, including the collapse of the upper storey. The repairs and renovations were made under the supervision of Major Robert Smith, Bengal Engineers, and completed in 1829. The new inappropriate sandstone cupola, or 'chhatri', was removed by order of Lord Hardinge in 1848.